RTW BRINGS GERMAN ENGINEERING TO THE U.S.
LANCASTER, PA, MARCH 20, 2013 — As part of its expansion into the U.S. market, RTW, a leading vendor of visual audio meters and monitoring devices for professional broadcast, production, post production and quality control, is proud to announce today the opening of its new facility in the United States. RTW’s U.S. branch, RTW International, Corp., is officially open for business in Lancaster, Pennsylvania. The new office is the first U.S. location launched by the Cologne, Germany-based RTW, offering further proof of the company’s continued dedication to supporting its customers and dealer networks in the U.S.
You’ve got to trust your meters. A user needs to trust in the device he is using for measuring and, therefore, trust its manufacturer. RTW has been a reliable source of innovative audio measurement tools for more than 45 years, bringing its pedigree of precise German engineering to each of its innovative solutions. Along with the company’s ground-breaking products comes a commitment to service. RTW has a longstanding reputation of working with its customers to ensure their experience with RTW products is a positive one. Over the years, countless audio engineers and mixers have relied on RTW products to meet critical audio standards all over the world. With the advent of the CALM Act, RTW has recognized a clear need in the U.S. marketplace for its loudness metering tools and has now, based on that need, planned to further expand its operations and customer reach in the United States. 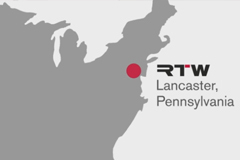 RTW prides itself on providing the best customer service it possibly can and recognizes the importance of location to its customers, which is why the company has opened its Lancaster, Pennsylvania office. The new U.S. office will house all customer service, repair and final product assembly activities for U.S.-based RTW customers, further reducing product delivery lead times. To lead the office, RTW has hired Christopher Spahr to be its new U.S. Director of Sales and Operations. In this new role, Spahr will oversee all brand, sales and market development in the United States. In addition, Werner Haase, from the RTW development team in Cologne, will join Spahr in Lancaster, overseeing product service and final assembly. Guided by its thorough research, knowledge and commitment to quality, RTW has produced a range of products for the professional audio community that are reliable, easy-to-use and compatible with a variety of leading audio equipment available in today’s marketplace. Over the last few years, it has significantly expanded its product offerings with the successful TouchMonitor series of audio meters. Its award-winning TouchMonitors, the TM7 and TM9, debuted in 2010; since then, RTW has introduced updated versions of those products, as well as the latest additions to this family including the TMR7 for radio stations, and the TM3, which is the entry-level device of the TouchMonitor series. The unique operating concept behind the TouchMonitor family is based on a 16:9 touch-sensitive screen, allowing a user to simply swipe a finger to interact with the graphical user interface. It offers not only a built-in online help function, but also allows for monitoring separate signal groups using multiple instruments at the same time. All TouchMonitor meters are built from a state-of-the-art hardware platform. Depending on the user’s preferences, he can choose a device with analogue or digital connectors, or both, including 3G. In addition to the standard versions featuring desktop enclosures, external power supplies and an integrated stand, RTW also offers OEM versions that can be integrated into mixing-console surfaces. The modular software concept of the TM7 and TM9 provides excellent value for money. Based on a user’s specific needs, he can purchase only those features that are necessary. Some of these options include Loudness meters, the Surround Sound Analyzer and VU meters (the addition of other available instruments that a user may be interested in, is always possible). The user can then individualize his view on the display to see only those instruments he needs in the size and arrangement he prefers. Both in terms of measuring devices and view, the TM7 and TM9 are entirely customizable. The success of the TouchMonitor series has broadened RTW’s market reach, providing connectivity solutions to numerous professional markets. Now with a stronger presence in the United States, RTW plans to further that reach, supporting the professional audio community with its stellar German engineering, expertise and customer service.